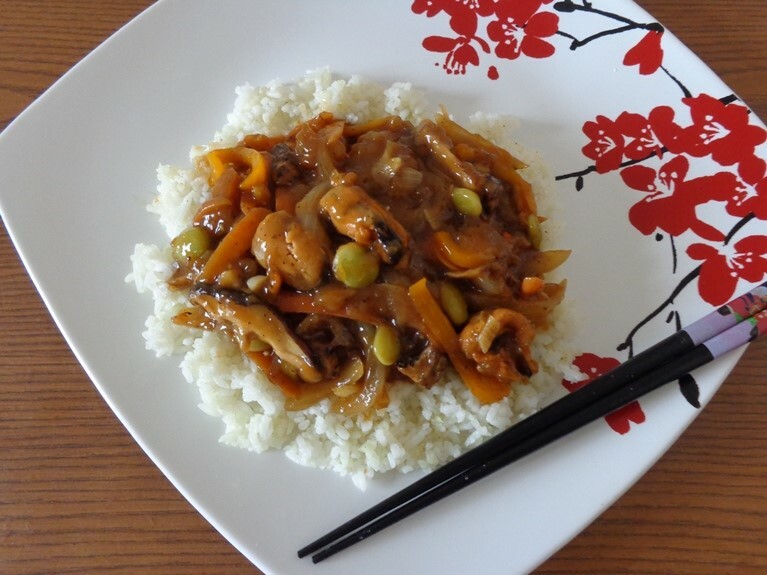 Check out this Rice and Seafood Vegetables Asian Gravy dish by VeeTee member Hidemi Walsh. Here's the story and inspiration behind this recipe: Inspired by one of my favorite Japanese food, Ankake yakisoba (stir fried vegetables and meat or seafood with sweet salty thick sauce over the stir fried ramen noodles). I made healthy version which means I added VeeTee rice as a substitute for ramen noodles. You can add any kinds of vegetables or seafood or meat. Many people in Americas love “biscuit & gravy” for breakfast so how about “Rice and Gravy” for lunch or dinner “? 1. Make seasoning. 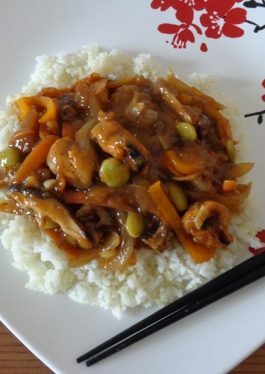 In a bowl, mix together 1 cup water, oyster sauce, soy sauce and sugar. 2. Heat 1 tablespoon sesame oil in a wok or heavy deep skillet over medium-high heat. Add carrots, onion and peppers to the wok/skillet and stir fry until crisp tender. Add garlic, and stir fry until fragrant. Add shrimp, mussels, shiitake mushrooms and edamame and stir fry until shrimp and mussels are cooked through. Stir in seasoning. When it starts to boil, reduce heat to medium-low and cook stirring occasionally for 2-3minutes. 3. In a small cup or bowl, stir together cornstarch and 4 tablespoons water. Then add the mixture to the wok/skillet and stir until combined and thickened. Add salt and black pepper to taste. Turn off the heat and stir in 1 teaspoon sesame oil. 4. Cook rice following by the package directions. 5. Divide the rice and gravy among two servings. Put the rice on each serving plate. Put the gravy over the rice.